on Friday, 08 March 2019. Artificial grass is a great solution for commercial spaces as it requires very little maintenance during the course of the year. A synthetic lawn eliminates the need for mowing and spreading fertilisers or pesticides, saving you both time and resources. If your artificial lawn resides under trees, then you may need to give it the occasional brush off to clear any fallen debris. Outside of that, artificial grass only needs an occasional hosing off. Commercial businesses often have a requirement for either employing somebody in-house to take care of the properties maintenance, or source external services to keep the aesthetic of the property looking pristine. Because artificial grass is low maintenance, you’ll also benefit from reduced maintenance costs. You’ll no longer need a lawn mower, pricey fertilisers and pesticides, gardening tools or high water bills from sprinkler usage. Ever heard the famous saying “first impressions are lasting impressions”? This is particularly key to your commercial property, especially when you are conducting a professional business. Artificial grass will help to keep the external aesthetic of your commercial space looking pristine all year round. When professionally installed, the surface area is prepared and artificial turf fitted with clean fluid edges for a professional finish. Artificial grass has helped to save millions of litres of water by eliminating the need to use pesticides, fertilisers and herbicides, and in general, no watering. Apart from the occasional hose off as part of the minimal routine maintenance that synthetic lawns require, your water consumption will greatly reduce thanks to an artificial lawn. Our artificial grass products have a long life expectancy even under heavy foot traffic. Synthetic grass is extremely hard wearing, meaning your grass will remain pristine all year round, despite being walked across frequently. During rainier times, unlike traditional grass, artificial turf will not form mud puddles, become boggy or flood. When an artificial lawn is installed by a professional, an effective drainage system will be put in place while the area is prepared prior to your new lawn being fitted. 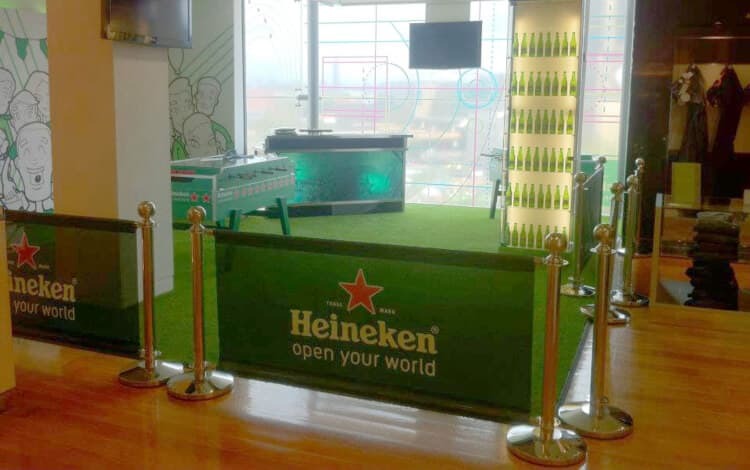 Artificial grass can also be installed indoors, making it an eye-catching alternative option for flooring that can be used in reception areas, staff break-out spaces, exhibition stands and pop-up events. It's an effective way to bring a piece of the outdoors into your building. If your a commercial company or entity looking for a professional landscaping service, please get in touch with us to discuss the best solution for your business. How Can Artificial Grass Save You Time and Money?